The Black Spot Tuskfish (Choerodon schoenleinii) is large fish species that is a member of the ‘Wrasses and Tuskfishes’ family Labridae. This species is considered to be excellent eating and is one of the best eating reef fish species. Adults are blue-green in colour and generally always have a black spot at the dorsal fin base. The smaller juveniles usually have a small black spot at the dorsal fin base and the juveniles also have a large white saddle spot following the black spot. The Black Spot Tuskfish can be found living on coral reefs and in coastal embayments over sandy/silty bottoms. It is also commonly found inhabiting shipwrecks of the south-east Queensland coast. It is a solitary species and is known to feed on hard-shelled prey including crustaceans, molluscs and sea urchins. Black-Spot Tuskfish (Choerodon schoenleinii) grow to about 90cm (15.9kg). At sexual maturity they are around 53-54cm in length. Adult and juvenile fish are different in colouration, however, both can be identified by a conspicuous black spot located at the base of the soft dorsal fin. The spot can be faint or absent in some fish. 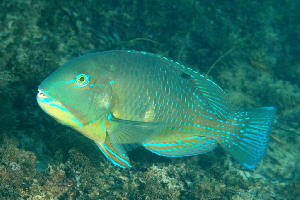 Adult fish are blue-green along the back with short blue bars on each scale. The tail is darker blue-purple and the tailing edge of the dorsal fin is golden orange. Juveniles are olive green along the back with yellow bellies. Their scales also have short blue bars and they have a series of blue lines near the eyes and mouth. These fish have well-developed tusk-like teeth which they use to move aside dead coral rubble. They then use powerful pectoral fins to shift sand, exposing part buried crabs, which they then feed on. Not commonly found as a commercial fish in markets. Highly priced fish in Sabah, Malaysia and exported to Hong Kong. Best served steamed. Good to know. Domo arigatou!